Executives from the biggest mining companies in the country, government officials and both local and international investors descended upon the Cape Town International Convention Centre this past week to discuss opportunities in the industry. Just six kilometres away in Woodstock, there was another gathering of stakeholders – non-profit, faith-based and non-governmental organisations and community representatives, who also discussed the future of the industry, but with a specific focus on its impact on communities. 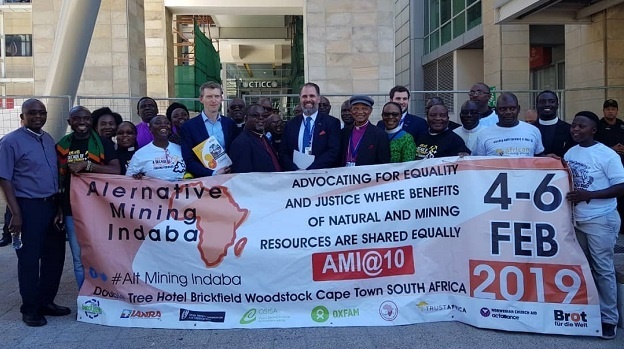 The Alternative Mining Indaba (AMI) started 10 years ago, to create a platform for communities to raise their concerns, chairperson of the AMI steering committee, Felix Ngosa, told Fin24 on Tuesday. Ngosa said the NGOs had initially attempted to participate in the Mining Indaba, but it was far too costly to get community members to attend. “So we started AMI – to have a space to bring communities and other stakeholders of society to raise their voice of the issues that surround the people and the communities that are affected and impacted by mining. “The other side (Mining Indaba) was a business conversation,” he said. The AMI was designed to discuss the impact of mining on communities in terms of pollution, possible community displacement, and, most notably, community participation in accepting mining projects. Ngosa said communities wanted to be part of the whole process when rights were granted to companies to start mining in areas where they lived. “We want to be consulted, we want our voice to be put on the table,” he said. Ngosa said the AMI had been making progress in getting communities to raise their concerns to those with influence. Over the past four years, the AMI has also been able to send representatives to the Mining Indaba to speak at its various sessions. “One of our participants, a civil society leader, is speaking with those mining companies to raise their voice at the Mining Indaba, and remind people it is not just about profit. Asked if the new Mining Charter addressed the concerns of communities, Ngosa said although there has been progress in legislation across Africa over the past 10 years, the implementation of those laws is still lacking. “There has been progressive movement in terms of putting in place laws to do with taxation, environment and management of industry. We see a bit of a lapse [in] implementation,” he said. At each AMI, a declaration is drawn up, and delegates march to the Mining Indaba where their demands are handed over. Ngosa said for seven years, the organisers of the Mining Indaba didn’t collect their list of demands, but there was a breakthrough three years ago. “For the past three years, we have been able to deliver our declarations to various stakeholders,” he said. The AMI met with officials from the Mining Indaba on Wednesday and successfully handed over their declaration booklet. Bishop Joe Soaka pictured with some officials from the Mining Indaba who met some of the AMI delegates to receive their declaration booklet. (Supplied). Following the event, the various NGOs will continue engaging with various stakeholders in mining, including the Southern African Development Community and the African Union – with the hopes of participating in shaping the vision for African mining. The AMI movement has spread across the continent and is hosted at a national level in 15 countries, including Zambia, Tanzania and Namibia.